Today I have another brew in front of me that is sure to be lovely. 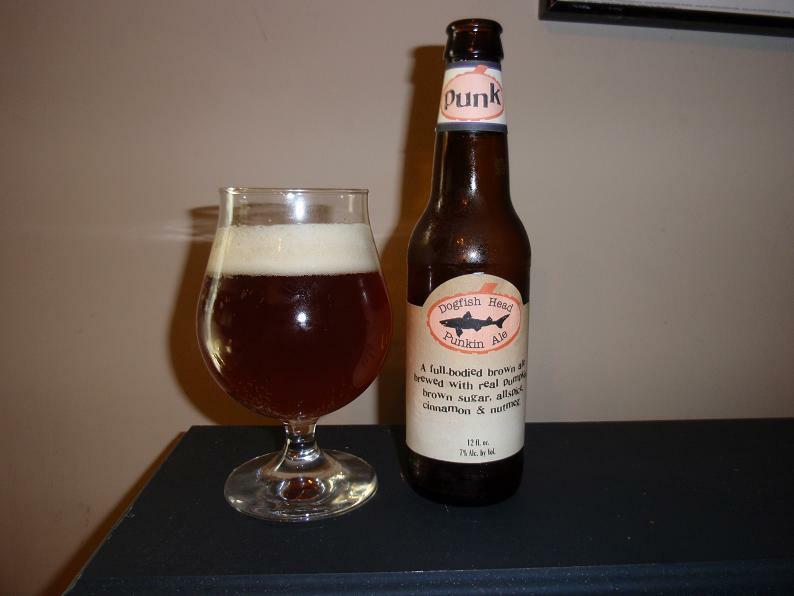 Punkin Ale from the creative minds of Dogfish Head is you guessed it, their take on a pumpkin beer. Unfortunately Dogfish Head is not distributed in my state of Minnesota but luckily we can get it just across the border in Wisconsin which is where this bottle came from via my good friend Ben. Sam Calagione and his crew at Dogfish Head brew some of the most unique beers in the industry including a myriad of brews adapted from ancient recipes, the most recent being Chicha which is brewed in a Peruvian tradition of chewing on grains to release starches. Their slogan may be off centered beers for off centered people, but that doesn’t mean they aren’t also delicious. From the description this is “A full-bodied brown ale brewed with real pumpkin, brown sugar, allspice, cinnamon & nutmeg. Let’s see how it goes. This ale pours a bright orange ruby hue that is a bit hazy but still moderately opaque. Head is about two fingers and very white in color lasting only a few minutes but leaving a nice ring around the surface after fading. Smells strongly of pumpkin, cinnamon, nutmeg and some nice malty sweetness. Flavor is really quite nice. A solid malt backbone that you would expect in a quality brown ale does a wonderful job supporting the mild pumpkin flavor and accompanying spices and herbal notes, particularly gentle cinnamon. Malt flavors are moderately sweet but also nicely bitter creating a wonderful balance of flavors. Mouthfeel is rather carbonated but not uncomfortably so. Body is a light medium. Obviously Dogfish Head has a lot of experience in brewing with unconventional ingredients and this beer is a perfect example of practice making perfect. Not only is this beer an example of what one can do with a pumpkin ale but also spiced ales in general (“holiday ales” as some refer to those released around Christmas). It is clear that the brewers took a solid brown ale base and thought mostly about balance when crafting this beer. Though I love the sweet, highly spiced and pumpkin flavored Pumpking by Southern Tier [review] this ale shows that sometimes simpler is better. With a 7% ABV you can easily have a few of these while handing out candy to the local children…or a bunch while cycling around the city like a hooligan. Unquestionably another wonderful brew from the fine folk of Dogfish Head and my new favorite Pumpkin Ale (I still love you Southern Tier). Give it a shot and ride your bike.